Halls of residence available in Truro. * All bookings must be made directly between students and Treliske. Contact Treliske for further information. Treliske Hall in Truro is a brand new development located just outside of Truro on the Royal Cornwall Hospital site. It's ideally situated for medical, nursing and dental students training at Treliske Hospital in Cornwall. There are over 130 rooms with double beds and both en-suite and shared bathroom facilities are available. Each flat also contains a stylish kitchen/lounge area which is fully fitted with modern furniture and appliances. These halls of residence are available to students from Plymouth University who are working or studying on the Treliske Hospital site. The brand-new complex is divided over seven blocks, each block consists of eight flats, with three, four or five rooms per flat. Secure electronic entry to the buildings. 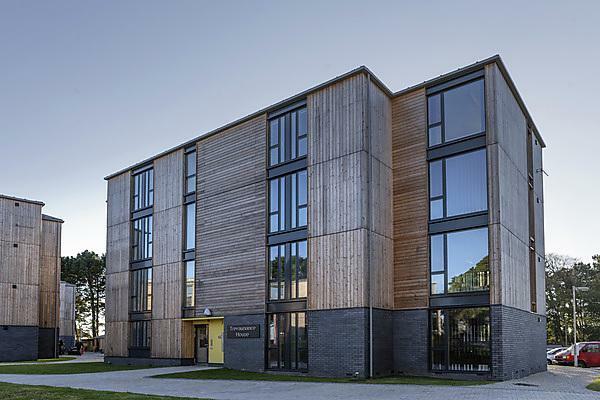 This modern and stylish hall of residence is located just outside of Truro on the Royal Cornwall Hospital site.